I grew up convinced that I was totally deprived because I didn't have a dog. In fairness, I should mention that my family actually did have a dog. But Choo-choo was sixteen years old, blind with cataracts, and pretty much just liked to sleep. Sure, she was gentle, tolerant, obedient--but what did that matter when she was old and couldn't do any cool tricks? She weighed about twelve pounds, so I couldn't ride her like Belle from "Belle and Sebastian," or Falcor from The Neverending Story. She couldn't talk, like Poochie , or Cooler from "Pound Puppies ." She wasn't a scrappy ragamuffin from the streets, like Boomer, or Benji, or Sandy from Annie . She lacked heroism. She was never going to save me from imminent danger, like Chips the War Dog or the wolf-dog from The Journey of Natty Gann . She also was not an alien. There went my "Fluppy Dogs " theory. 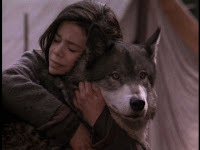 After reading Julie of the Wolves like a how-to guide then coming home to watch "Lassie " reruns on Nickelodeon in the afternoon, I was pretty convinced I would be an awesome dog trainer. "Lie down, Choo-choo!" I would say. (She would remain prostrate on the couch.) "Good dog. Now beg!" (She would open one cloudy eye, if I was lucky.) "Okay then, drool, Choo-choo, drool!" (This she would do with utter abandon.) "Good girl." Why did the '80s have so much dog-centric programming? Was it to ensure against a new generation of Cat People? Was it to make the allergic kids feel even more unloved? Or was it just to put us off guard, so that when we were all subjected to Sounder , and Shiloh , and Where the Red Fern Grows in middle school, we would all feel appropriately devastated? Of course, when your dog goes all Old Yeller on you and dies, you could always revive him, per Frankenweenie.